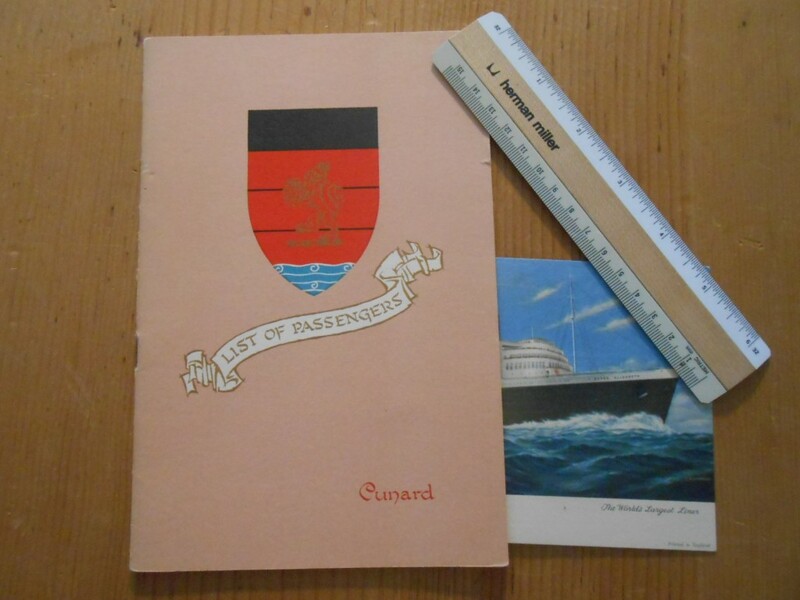 Lovely Mid-50’s PL and portrait log abstract for a May voyage aboard the Lizzy. Excellent shape with gold trimmings on the cover. The ship averaged 29.67 knots! I’m not sure which cruise line started usung thse dishes in the 1970’s as souvenirs… but almost every old world “luxury” line had adopeted them and they were a staple onboard well into the 1990’s. This rosenthal dish celebrates the DEC7-19 Caribbean cruise of the Hanseatic … she was once Zim Lines flagship Shalom. 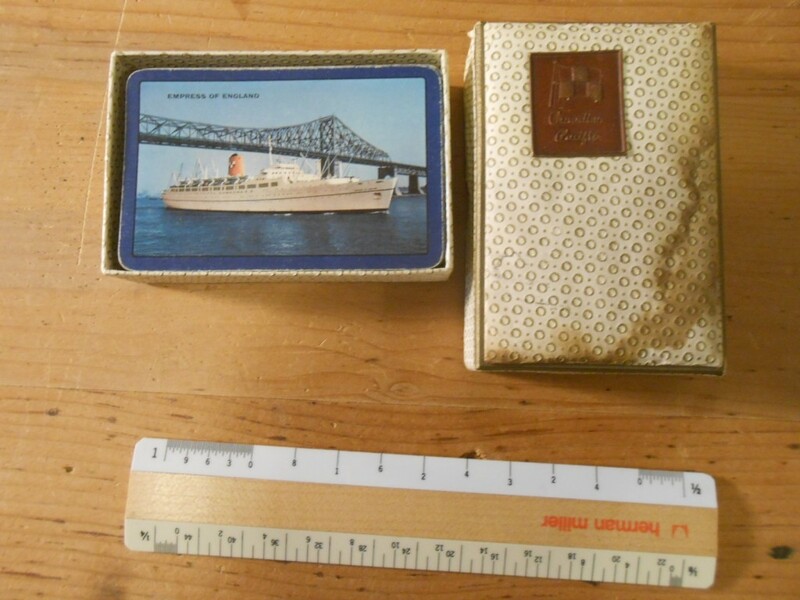 I’m not sure which cruise line started usung thse dishes in the 1970’s as souvenirs… but almost every old world “luxury” line had adopeted them and they were a staple onoard well into the 1990’s. 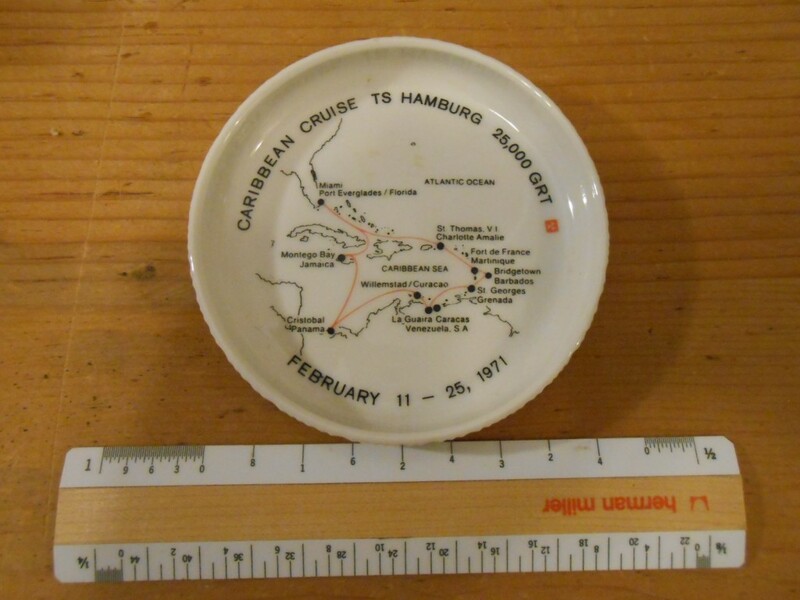 This rosenthal dish celebrates the Feb 11-25 Caribbean cruise of the Hamburg … German Atlantic’s “spaceship”. A cruise the started on Valentines day to Trinidad. There were almost 1300 (1278) folks onboard this cruise … probably a good money earning trip for the ship. She was barely 4 years old. Awesome set of cards with minor edge wear for the EOE … and contained in a padded case. The case does have some liquid staining =( … but it is still lovely! The case also has a texture CP script logo on the front. 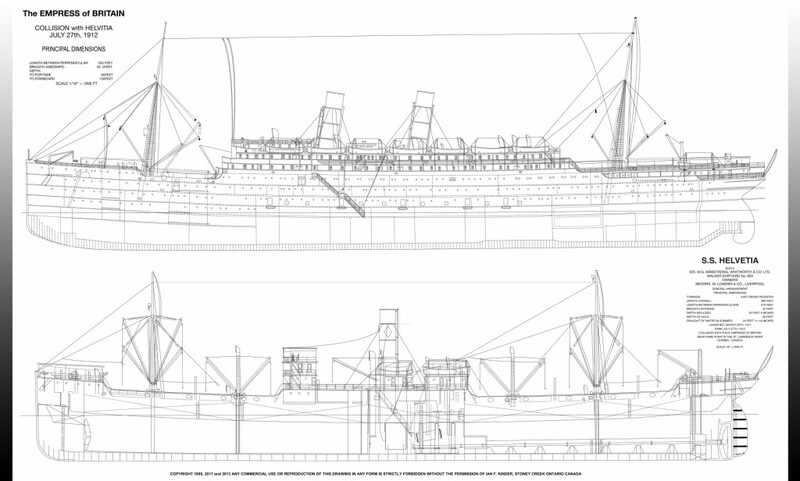 Outstanding little plan for the GC … sister to the lovely Augustus that just was scrapped at Alang about 4 years ago. 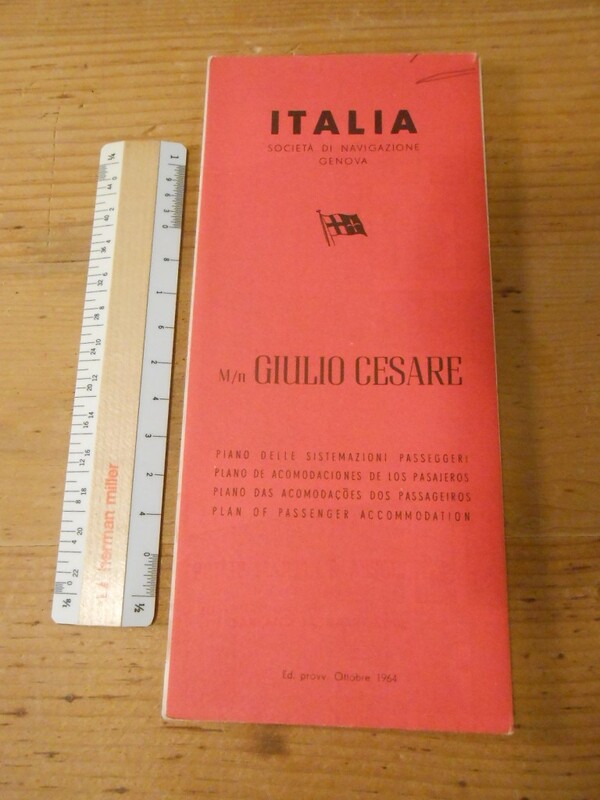 They were Italy’s first new build’s after WW2 and set the Italian Line design trend of their ships for the next decade. Great little plan! 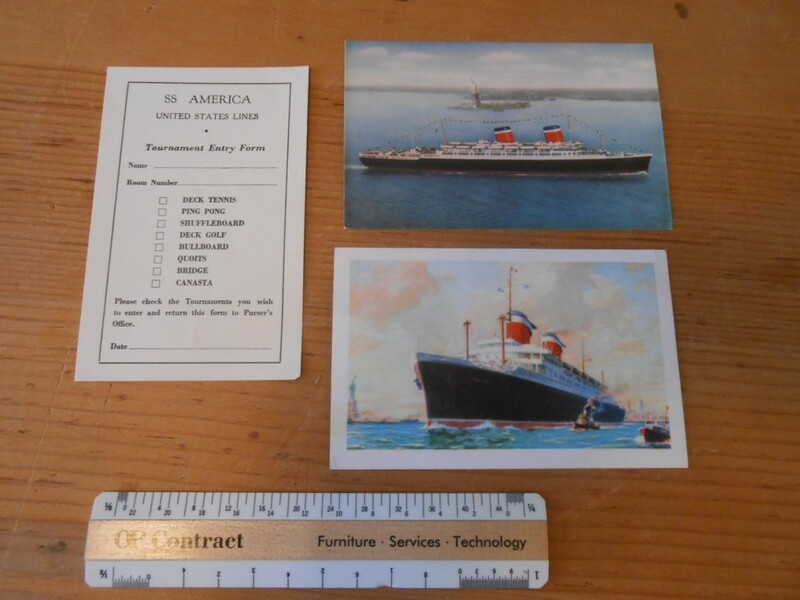 Three great items for the lovely SS America. 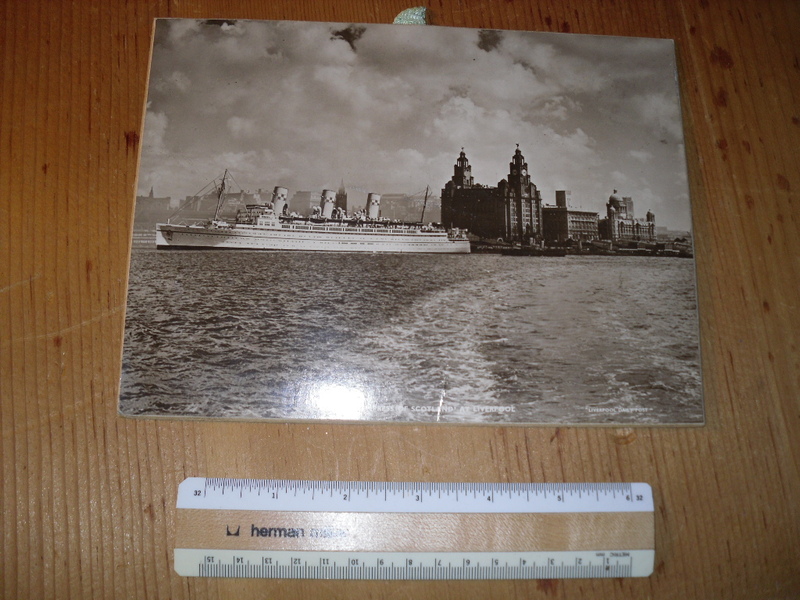 There is a tournament form for ships activities an Alwyard Image postcard and a lovely postcard image of the ship passing the Statue of Liberty. Great little collection in great shape. construction of the Empress of Britain and the Empress of Ireland from the keel up. the Empress of Ireland collided. Very rare pictures taken aboard the SS Storstad and the SS Helvetia. Ship’s plans and diagrams showing the collisions that occurred involving all four ships and so many mysteries revealed. If you wish you can order this book directly from Ian at either his website @ www.theempressofireland.com. Shipping to the US and Canada is $10 and Ian will quote postage for other world wide locations. 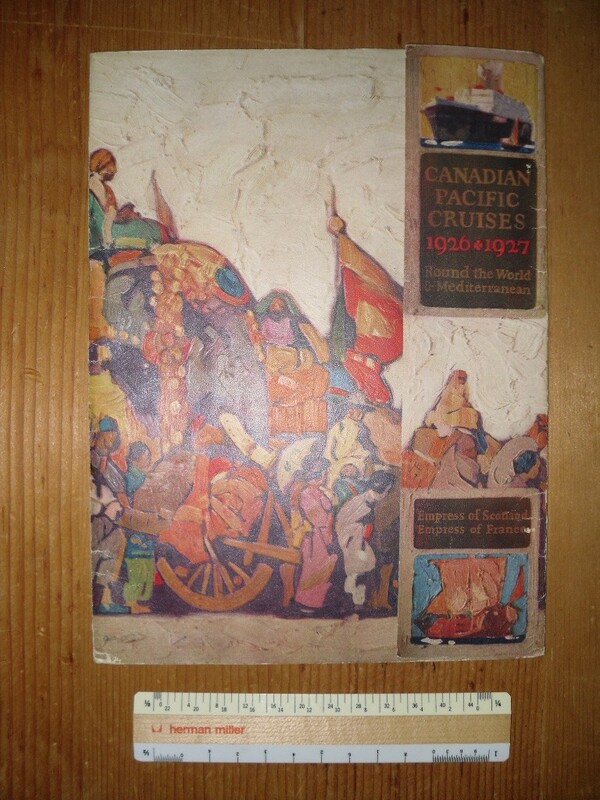 Beginning this month, I am partnering with Canadian friend and (Empress of Ireland fanatic) Ian Kinder to offer several of his EOI related items. 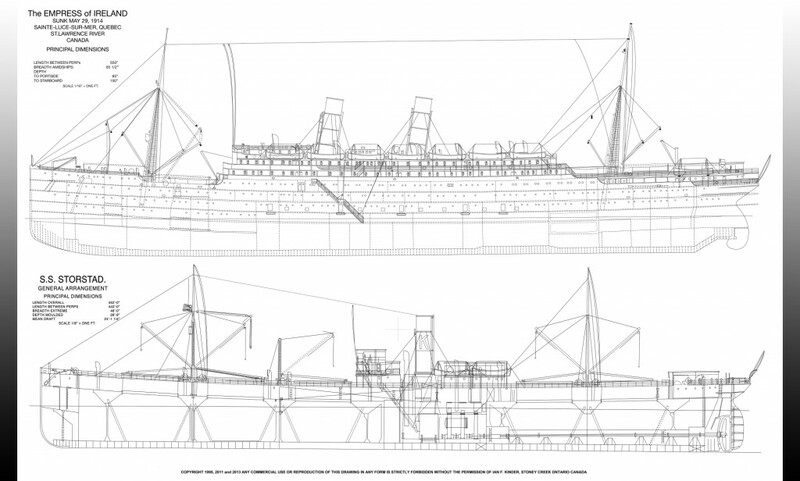 Here we have a magnificent set of huge plans for the Empress of Ireland which includes: the Rigging Plan, Boat Deck, Upper Promenade Deck, Lower Promenade Deck, Shelter Deck, Upper Deck, Main Deck, Lower Deck and Orlop Deck. These plans were hand drawn by Ian and then reproduced on FSC and SFI paper … completely suitable and perfect for framing! They are approximately 72″ x 36″ in size! I encourage you to check out Ian’s website: www.theempressofireland.com/. 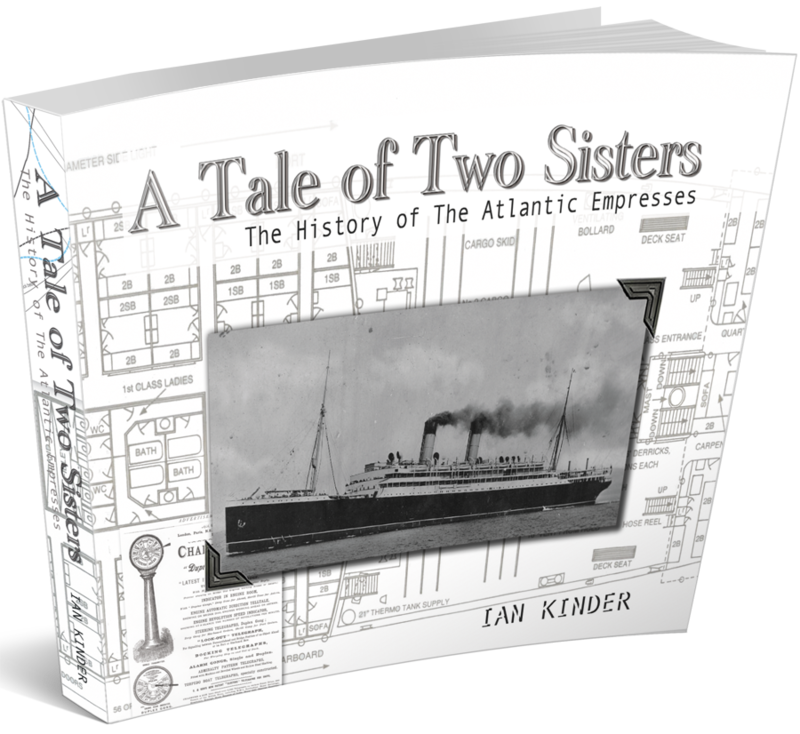 Ian is in process of putting the final touches on a new Empress Of Ireland book that should be available in later December 2013. If you purchase this item from GLL, I will contact Ian and he will ship the item directly from his stock in Canada. Please allow 3 weeks for shipping. Due to my site limitations I can only show 2 decks .. so I chose to show the boat deck and upper promenade deck … you can see all plans on Ian’s site. Beginning this month, I am partnering with Canadian friend and (Empress of Ireland fanatic) Ian Kinder to offer several of his EOI/EOB related items. This a lovely rigging profile of both the Empress of Britain and the Helvita. Fate is a funny thing …The Helvetia sank in a collision with the EOB about 2 years before the Empress of Ireland was sunk by a similar collier the Storstad. These plans were hand drawn by Ian and then reproduced on 40″ x 24″ FSC and SFI paper … completely suitable and perfect for framing! I encourage you to check out Ian’s website: www.theempressofireland.com/. Ian is in process of putting the final touches on a new Empress Of Ireland book that should be available in later December 2013. If you purchase this item from GLL, I will contact Ian and he will ship the item directly from his stock in Canada. Please allow 3 weeks for shipping. Beginning this month, I am partnering with Canadian friend and (Empress of Ireland fanatic) Ian Kinder to offer several of his EOI related items. The first item is a lovely rigging profile of both the Empress of Ireland and the unfortunate ship that sent her to the bottom, the Storstad. These plans were hand drawn by Ian and then reproduced on 40″ x 24″ FSC and SFI paper … completely suitable and perfect for framing! I encourage you to check out Ian’s website: www.theempressofireland.com/. Ian is in process of putting the final touches on a new Empress Of Ireland book that should be available in later December 2013. If you purchase this item from GLL, I will contact Ian and he will ship the item directly from his stock in Canada. Please allow 3 weeks for shipping. 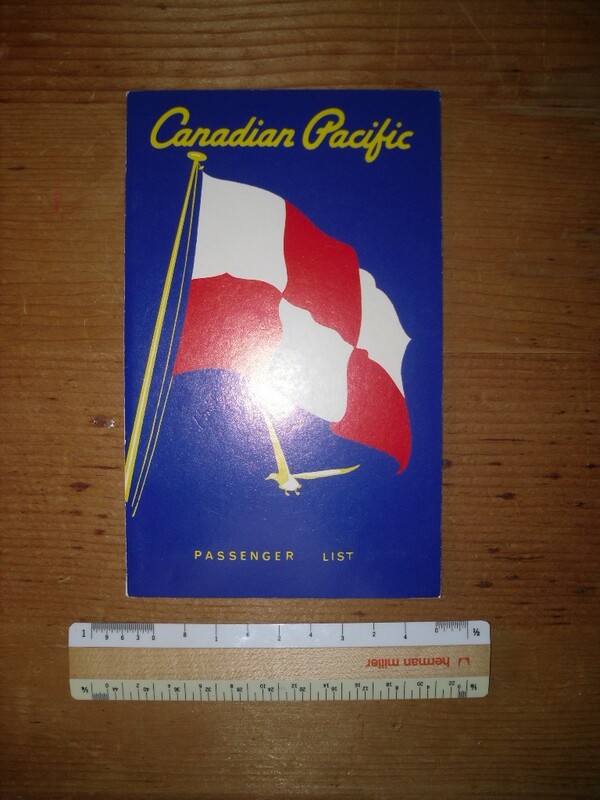 Canadian Pacific: Yukon Travel 1941 for Princesses’ Charlotte, Louise and Alice. Cute brochure describing routes, rate and information on the CP Yukon runs. The delicious part of these brochures are the tissue deckplan for all 3 ships that are folded up inside. Certainly small ships .. they have their niche in the Large and extensive CP travel system. One flaw: the back cover is missing about 1.5″ inch of the lower corner. They were not kidding when they said “mini”. This is just darling cute and tiny tiny tiny. 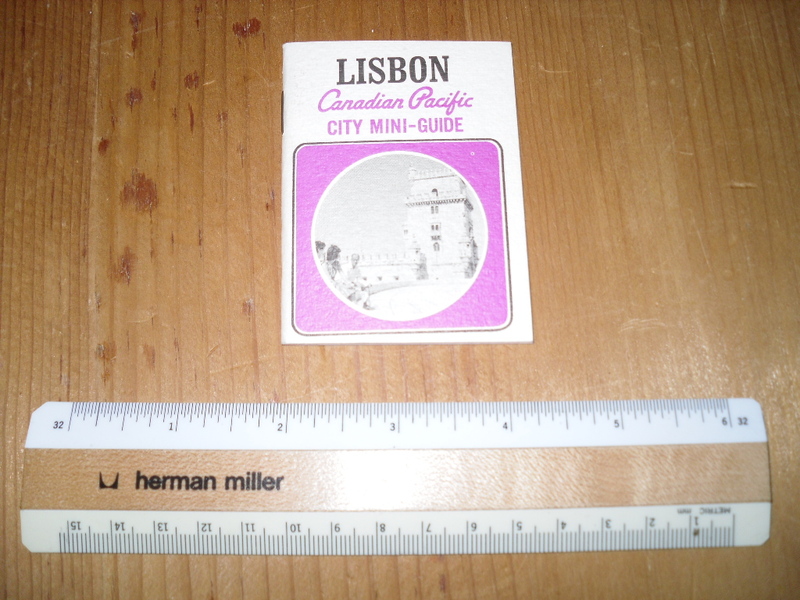 A little guidebook given to passengers on a cruise for “sites” to see around Lisbon. Mint condition! Pristine passenger list from a 1968 crossing to Liverpool from Montreal. Includes First and tourist class passengers. Great condition! Nice chipped in official profile rendering of the ship! 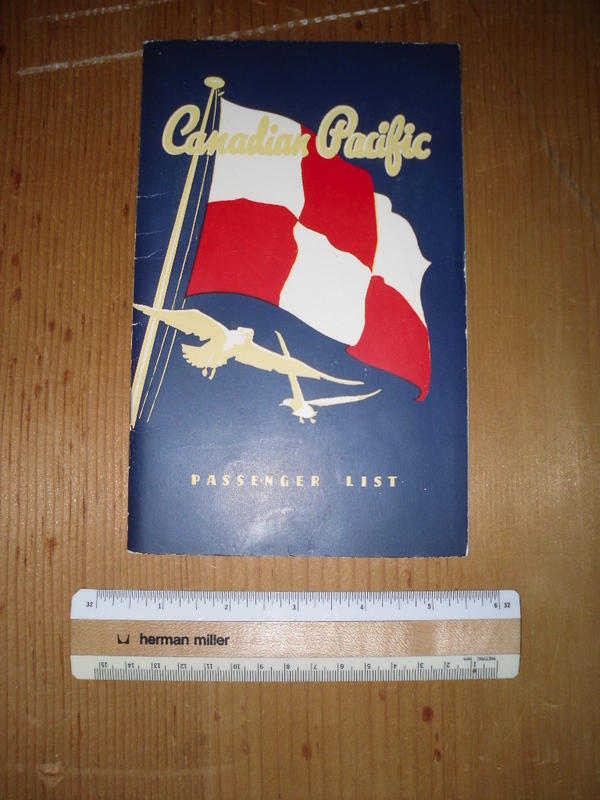 Pristine passenger list from a December 1955 crossing to Liverpool from Quebec. 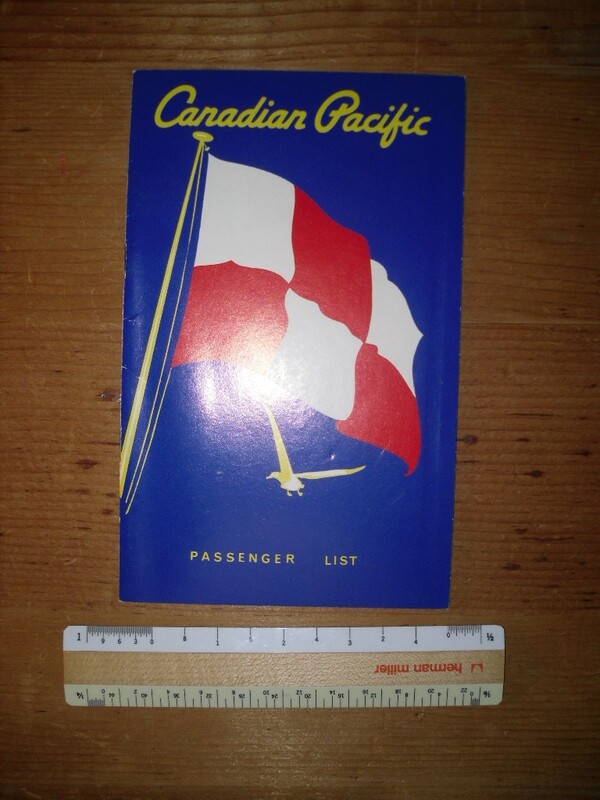 Includes First and tourist class passengers … and about 1/2 page of autographs. Great condition! 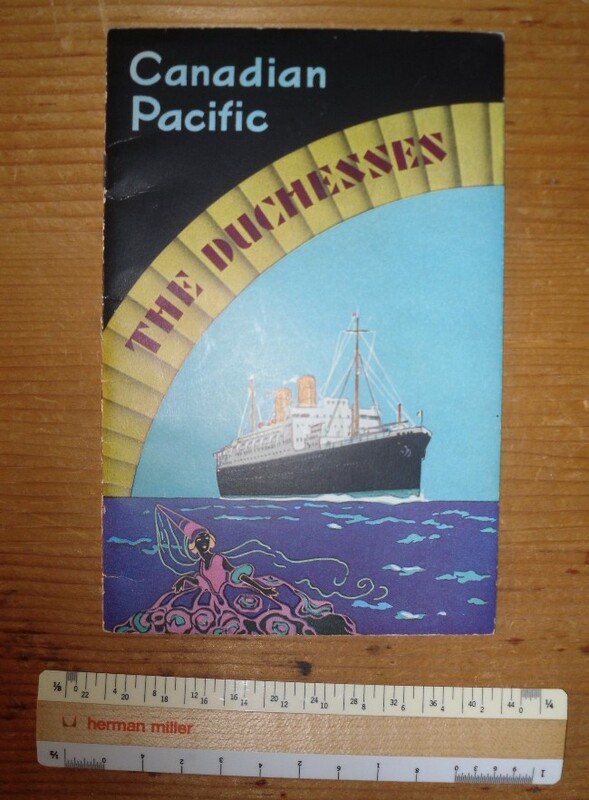 A footnote anounces the new Empress of Britain coming in 1956! A wonderfully thick brochure booklet advertising the 1926/27 ATW cruise for the EOS the and a 1926/27 Mediterranean cruise for the Empress Of France. Both started at NYC: The EOS steamed 28,400 miles and ended back in NYC 55 days later, The EOF went 10.937 and finished in Southampton after 33 days. There are 2 pages dedicated to each stop … one page being text and one being a portrait of a “citizen” at each exotic port of call. The ATW ports range from Algiers to Venice. Some minor edge wear and some age spots, but a beautiful brochure indeed! A passenger list for the DOY dated August 1938. 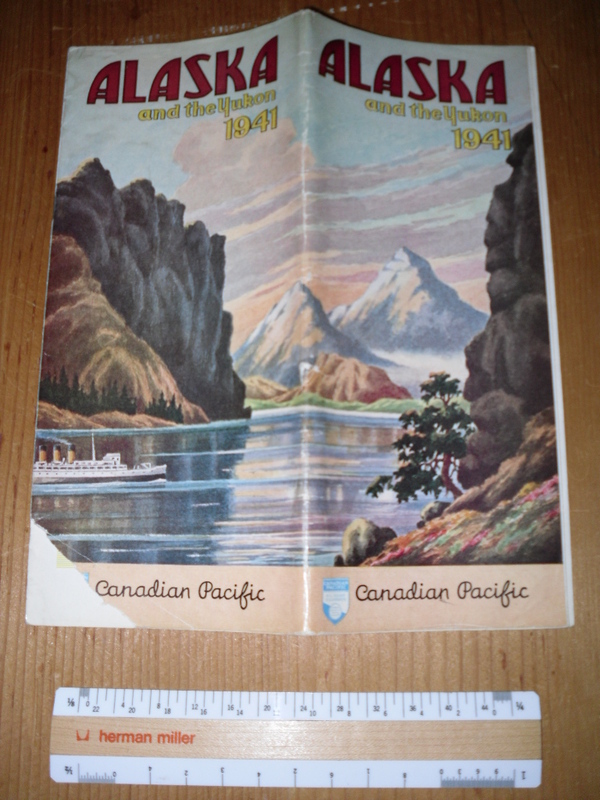 Several adverts inside including the Empress of Japan, Empress of Britain and the huge CPR hotel at Banff (still open today under different owners). Also includes an official portrait of the King and Queen in celebration of the opening of the “Empire” exhibit in Scotland.